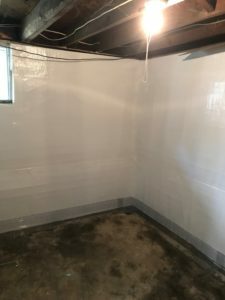 Perfect for making an unfinished or water-damaged basement a functional living space, Bright White Wall Liners have gained quite a bit of popularity in recent years because they are much less expensive than other alternatives. Instead of painting the walls or putting up other wall decorations, these Bright White Wall Liners are a great choice. 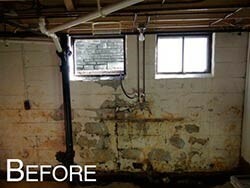 These products will help with basement waterproofing. When installed, Bright White leaves your basement with a clean, finished look, free of mold and mildew, and makes it the perfect space for a family room, home office, playroom, or extra bedroom. Before we install the Bright White Wall Liner, we’ll be sure to address any foundation or moisture concerns. 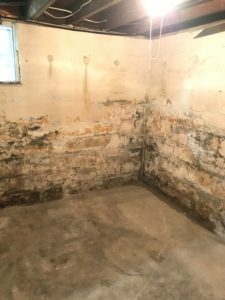 This includes securing the foundation, routing excess moisture elsewhere with a drainage system or sump pump, and eliminating any mold or mildew. It’s important that your basement is perfectly prepped for the wall liner, as we want to be sure that the materials underneath the liner are protected and stay dry throughout the year. 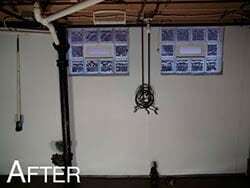 One way to do this is by investing in basement waterproofing. Lastly, we’ll professionally install the wall liner, giving your basement a bright, fresh new look. For more information regarding Bright White Wall Liner availability and installation, contact our friendly team at Foundation Solutions 360 today — we look forward to hearing from you!